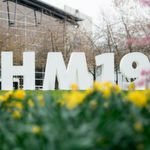 HSM GmbH + Co. KG, a south German office equipment manufacturer from Lake Constance, sets the focus at this year’s Paperworld on its slogan “Great Products, Great People”. 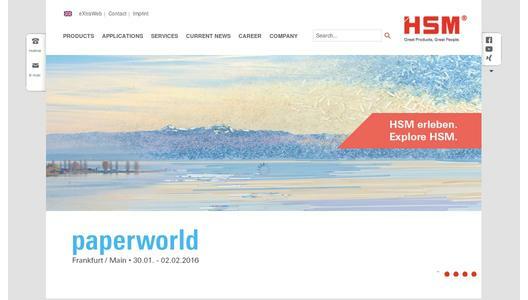 Visitors to the exhibition can thus experience not only data security, but also the hospitality and Lake Constance - the home of HSM. You can find the HSM booth at the usual place in Hall 3.0, booth D85. Explore HSM - Great Products, Great People. As before, HSM is basing the strategic orientation of the product lines on the proven “Good – Better – Best” strategy. With paper shredders from the HSM SECURIO line, you are optimally positioned in the category “Best”. 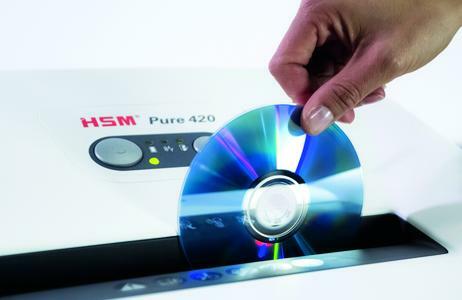 The new document shredder line, HSM Pure, now strengthens the category “Better”. Here, HSM is predominantly focussing on digital marketing. The HSM Pure line is the epitome of reliability due to its proven quality “Made in Germany” and a solid structure, as well as its timeless, modern design and ease of use. An optimum link between tradition and modernity - as a compact device by the desk or as a powerful document shredder for work groups and the department. Powerful low-noise cutting mechanisms and energy-saving management systems are used. High user safety is ensured by means of a pressure-sensitive safety element that stops the paper feed immediately in the event of accidental drawing in. The new document shredder line currently includes eight models, from security level P-2 up to level P-5. Developed and produced in Germany - with a lifetime guarantee on the cutting shafts. 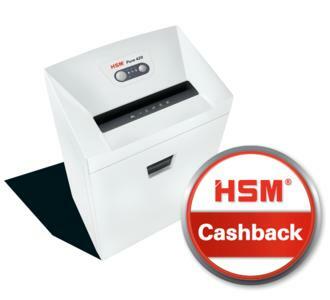 Four models with security level P-4, HSM Pure 320, 420, 530 and 630, are currently promotional products of an HSM cash back promotion. Here, the end customers benefit from a cash reimbursement of up to EUR 100 (depending on the model). To apply for and participate in the cash back promotion, private and business customers simply register in the HSM cash back portal (www.hsm.eu/en/cashback), deposit the receipt and directly obtain the cash back amount credited to them. To enable promotion applications, the retailers have a comprehensive marketing package and data feeds for easy implementation into their own online stores. The successful product line HSM SECURIO combines functionality, quality and durability with a timelessly appealing design. 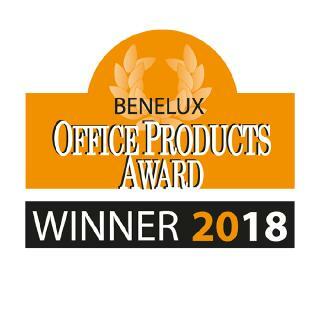 It provides an optimal solution for practically every working environment for the simple and safe destruction of documents - the C-line for the home office, the B-line for the workplace and the P-line for professional use. 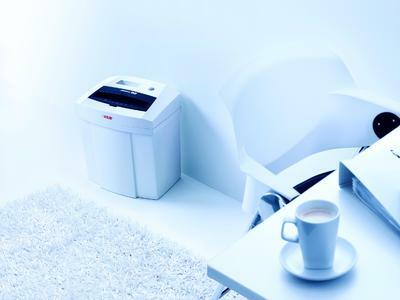 With the AF line devices with automatic paper feed, users with high volumes of paper have a paper shredder which destroys stacks of up to 500 sheets conveniently and efficiently. The latest addition is the HSM SECURIO C14. With the attractive product design in the fashionable colour white, the new model blends harmoniously into the SECURIO product line and is, with its compact dimensions and a volume capacity of 20 litres, the entry model of the future. It is reliable, quiet and has a power-saving management system. It consumes zero power in standby mode. A high level of security is ensured by the safety element, which immediately stops the paper feed upon light pressure. The HSM SECURIO C14 is available in the cut variants with 3.9 mm strips (security level P-2) and 4 x 25 mm particles (security level P-4). In addition to paper, credit cards can also be shredded. The cutting shafts are resistant to staples and paper clips, and come with a lifetime warranty. Furthermore, as with all models of the SECURIO product family, HSM provides 3 years warranty. HSM is continuously working on product enhancements and will implement the further development of the existing drive and operating concepts in the existing successful models of the P-line in the current year, and will present this at the Paperworld exhibition. Up to 40% higher performance, significantly reduced operating noise, intelligent and clean removal of paper jams and an appealing and innovative operating concept are just a few advantages that are combined within the drive system. The controls are on a high-resolution touchscreen which displays the operating states, as well as further information on usage, consumables and service contacts. Caution should be exercised when disposing of digital media since a countless amount of confidential data is stored on our computers, USB sticks, CDs and DVDs etc. The shredding of hard drives rules out any possibility of the disk being correctly reassembled. The new, compact hard drive shredder HSM Powerline HDS 150 breaks digital data carriers down into narrow strips and makes recovery impossible. It only needs an AC outlet (230 V), can be moved around on castors and is thus also suitable for the decentralised destruction of data carriers. The data carriers are inserted, at up to 210 pieces per hour, at a comfortable working height. The maximum throughput for the various kinds of cut is always obtained by selecting different functional modes. The collection container can be easily removed for emptying. The cutting shafts made of hardened solid steel break down the data carrier to be destroyed into strips of max. 40 mm wide, which corresponds to security levels T-1, E-2 and H-3 in accordance with DIN 66399. The hard drive shredder features a power-saving mode, which switches off the drive and display after a five-minute period of non-use. After pressing the button on the control panel, the device is again ready for use. Another positive side effect of the low-maintenance hard drive shredder from HSM is that the shredded hard drives can be fed back into the recycling process as a valuable raw material. The hard drive shredder HSM Powerline HDS 150 has an integrated operating hours and media counter, which shows information over the display. Not only the number of operating hours, but the number of destroyed hard drives and container emptying operations are also shown.